How much gold is too much for a mount? 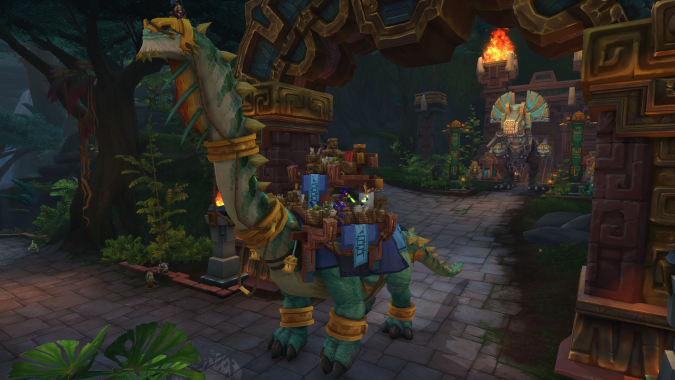 So that fancy dinosaur mount everyone was excited about finally has a price. And it’s a whopping FIVE MILLION GOLD. Now, to be fair, it’s a pretty ginormous mount. And it even has its own auctioneer and merchant riding with you, which probably more than makes up for the price. At the same time, five million gold is a hefty amount. Most people don’t generally amass a wealth of gold by spending it frivolously. A several million gold mount isn’t exactly new, since we had the mount I refuse to look at or name that cost two million in Legion. However, two million is one thing, while five million is a pretty big step up. Like dinosaur steps. It’s not like I have many qualms about spending gold. I didn’t bat an eye while spending 180k gold on the Grand Expedition Yak, and its reforger was pretty handy. I was positively pleased when that NPC was swapped to transmog when reforging went away. Arguably, it’s even better, as it’s important to look good wherever you go. And while I can justify the fact that spending five million gold just to have a mobile auctioneer to buy or sell whatever you want whenever you want probably makes it worth it, I still cringe at the thought of spending that much. Perhaps it’s also because I use gold to pay my WoW sub. I’m spending a considerable amount of gold each month as it is. There’s another avenue for gold that doesn’t involve farming, but don’t expect that option to be any easier. Going by the current rate of ~200k gold on NA realms, it’ll only take $500 to get a sweet dinosaur and mobile auction house. So what about you? What’s your cap on ridiculous prices for in-game items? How much gold are you willing to farm and spend in the game, and what makes it worth it for you?